This beer has the distinction of being the first beer ever reviewed twice on Beer O'Clock Australia. Previously it was reviewed under the European beer challenge heading but now it's managed to slot into the fridge regulars section. Last time I had 1936 Biere I was sufficiently impressed to go out and buy a 6-pack. Every time I've had it's impressed me, with the exception of the odd bottle which seems to have some issues. The brewery uses only Swiss sourced ingredients and leads the way in environmental protection. Noble as these intentions are, it matters for nought if the beer isn't good. Let's pour it and find out! So the photo is a little misleading, the beer is actual a very clear golden straw colour with a brilliant 3 finger head of thick white foam. The reason the photo doesn't quite look like this is surprisingly condensation on the outside of the glass, I wiped it with my finger and that's what I saw. One of the things that always impresses me about this beer is the retention of the head and the lacing. If you drink one of these relatively quickly, your entire glass will have lacing all over it; It's a brilliant looking lager! Having been following this beer for the last 9 months or so, the one element that has improved the most is the aroma. Gone is the slightly sour skunky nose to be replaced by a fresh clean lager smell. There are some nice earthy malts followed up with some floral and grassy hops. There is a slightly unusual citrus aroma, which even after drinking it semi-regularly for 9 months I haven't worked out. 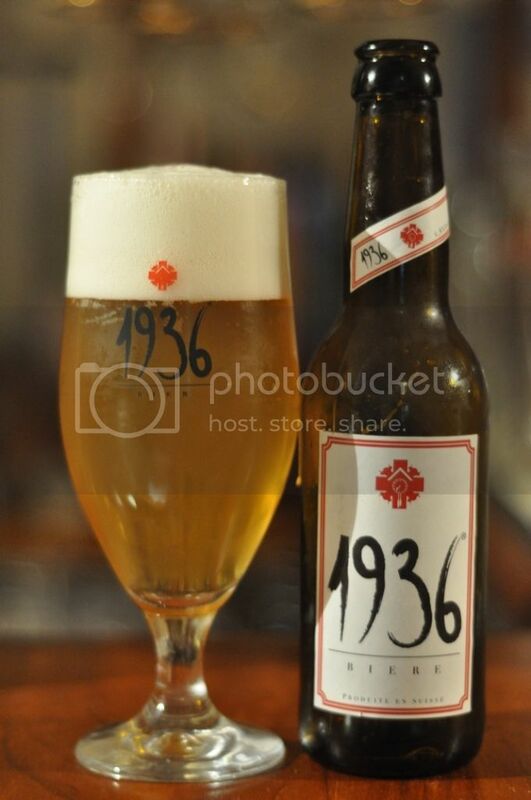 1936 Biere is a nice clean lager. The hops provide good flavour without overpowering the beer with bitterness. The quality of all-swiss ingredients shows through in the flavour and the drinkability is fantastic! This beer has a lovely light mouthfeel and relatively low carbonation, which makes it very refreshing. It's a really nice drinking lager which goes well in almost any situation, be it with food or even as a session beer. When you get a good bottle of this beer it's one of the best fully imported lagers in Australia. The only problem is that the variation between bottles can be huge. I can only assume theres an issue with distribution, but if they get his right this lager could really become a force within Australian lager drinking circles. With the quality that can be on offer here do yourself a favour and buy 1936 Biere if you see it, you shouldn't be disappointed.